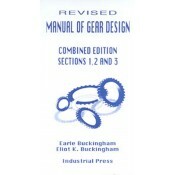 Volume I: Use of Tables for Change Gear Calculations. Tables of Consecutive Factorable Numbers. Brocot's Tables. Important Considerations in Computing Gear Trains. Mathematical Tables. Volume II: Nomenclature and Symbols. Plane Trigonometry. Involute Trigonometry. Design of Spur Gear Teeth. Design of Internal Gear Teeth. Backlash. Gear Tooth Loads. Appendix. Analytical Calculation of Y. Design of Gear Drives for Extreme Conditions. Accelerated Life Tests. How Design Errors Influence the Functioning of Gear Trains. US-Metric Terminology. Index. Volume III: Terms, Symbols and Definitions. Helical Gear Mathematics. Design of Helical Gear Teeth, parallel shafts. Recess Action Gears. Internal Helical Gear Drives. Planetary Gears. End Thrust and Bearing Loads. Backlash. Helical Gear Tooth Loads. Spiral Gears. Spiral Gears Mathematics. Design of Spiral Gears. Load Carrying Capacity of Spiral Gears. Index.